I love the cover. The photograph reveals the author’s arm. A $5 Starbucks gift card. 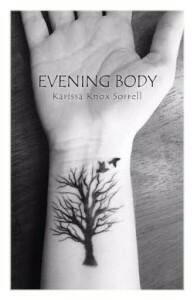 The only thing you have to do to enter your name in the drawing is let Karissa know you pre-ordered Evening Body (comment on her blog, email, Facebook or Twitter). The winner will be announced on August 1st. Find more info about the giveaway over at Karissa’s blog. Click here to order the chapbook Evening Body from Finishing Line Press. At the 2012 Southern Festival of Books in Nashville. 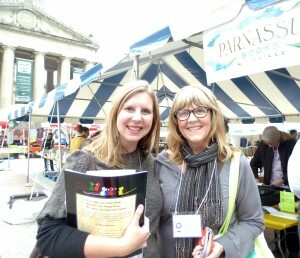 Karissa and I were Facebook friends before we finally met in person at the 2012 Southern Festival of Books in Nashville. Hers is one of a very few blogs which I read on a regular basis, and I’m thankful to call her my friend. 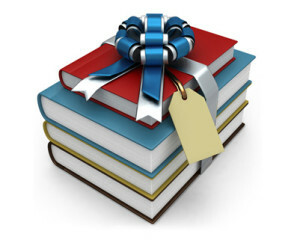 I know you’ll enjoy her chapbook… and GOOD LUCK winning the Booklover’s Gift Pack!